For many birders and other wildlife watchers, the month of May is just like Christmastime. 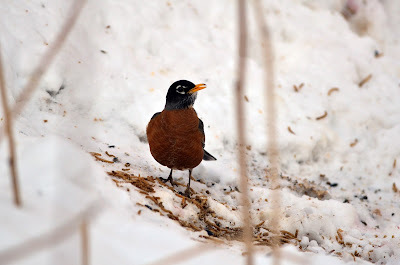 The return of Michigan’s migratory birds from their southern wintering grounds is cause for celebration, and many celebrate by heading to the fields, forests and wetlands to view these colorful harbingers of spring. 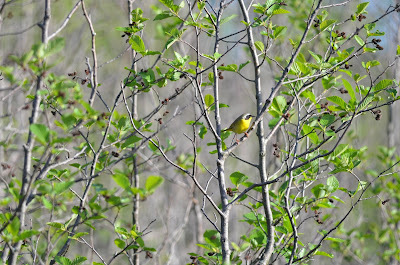 is a favorite spring migrant of many birdwatchers. Many of Michigan’s migratory birds spend the winter in the tropical areas of Central and South America, where food remains abundant all winter long. Many birders considered these neo-tropical migrants, like warblers, tanagers, buntings and orioles, the jewels of the treetops. With their bright breeding colors, these are the dazzling birds that many wait all year to see. “I love birding in May,” said Andrew Simon, a Macomb County resident and avid birder. “It’s the peak of migration and marks the return of my favorite birds – shorebirds and warblers. spring migrants to return to Michigan. Michigan is located largely within the Mississippi Flyway, but is on the western edge of the Atlantic Flyway. Flyways are north-south routes regularly used by large numbers of migrating birds. 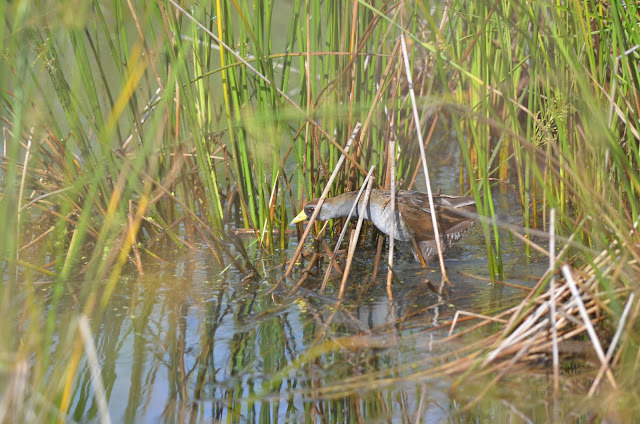 The juxtaposition of the two flyways, paired with our Great Lakes habitat, makes Michigan an outstanding place to observe a variety of migratory birds, from waterfowl to hawks to shorebirds to neo-tropical migrants. When southerly winds blow in the springtime, you can expect to see waves of migrants coming north on the winds. Watching the weather reports can be an effective method to tell whether your next morning of birding will be a productive one. rivers and wetlands in Michigan. Using the U.S. NEXRAD weather surveillance radar network, BirdCast can detect large concentrations of migrating birds by sensing the water in the birds’ bodies. Because many birds migrate at night, checking the radar at night is a good time to see if birds are headed your way. “Large circles of blue forming just after sunset are an indication that the radar is picking up biological targets like migrating birds, rather than rain, snow or other precipitation,” said Putnam. If the bird forecast is promising and you’re looking for a place to find birds in Michigan, there are some great public lands for you to check out. 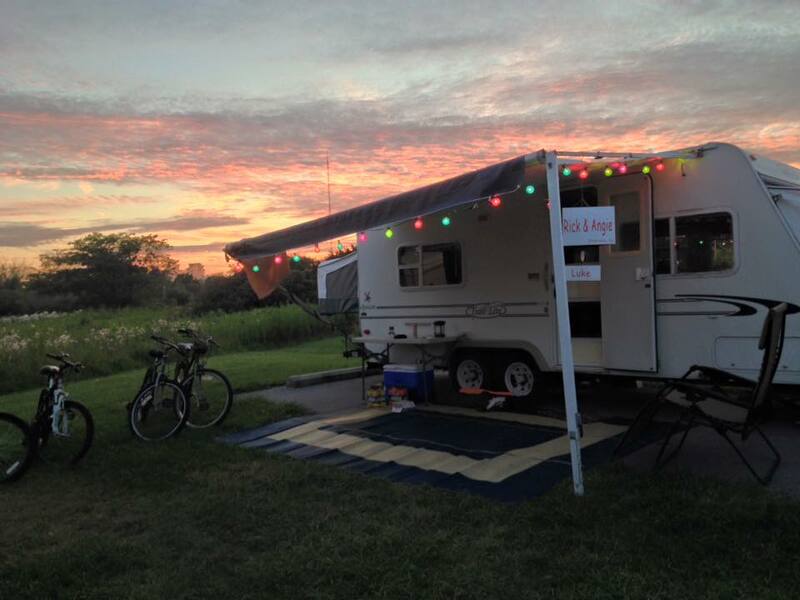 Michigan’s state parks, along with state game and wildlife areas are a great place to start. There are also several birding trails throughout the state, each with incredible places to stop and take a look around. 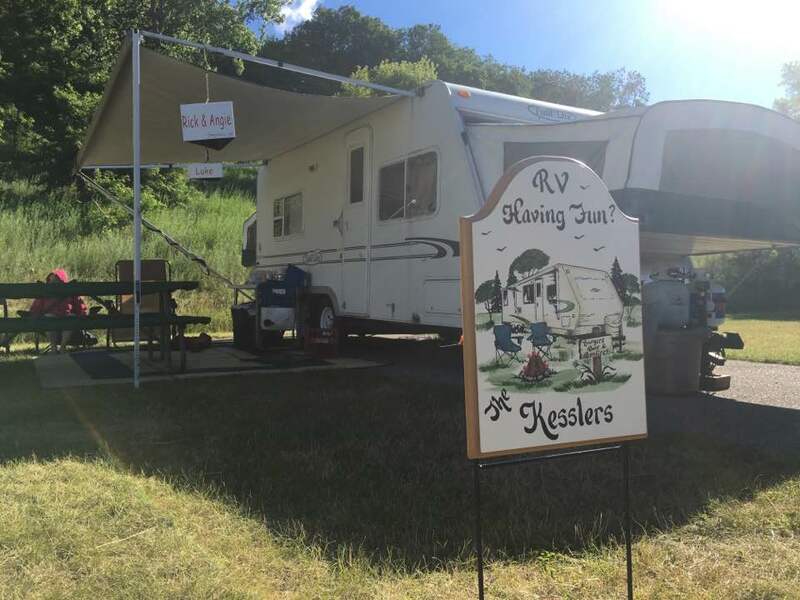 You also might consider heading to one of Michigan’s Wetland Wonders. 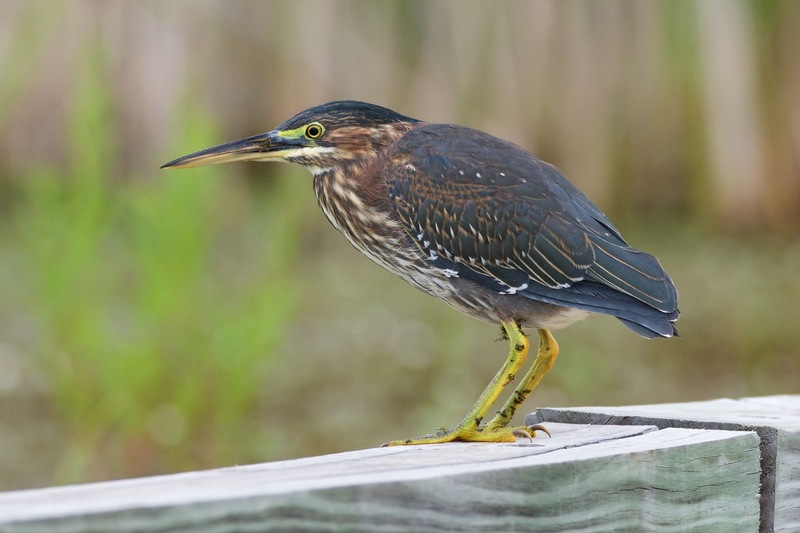 If you are a beginning birdwatcher, getting out on a birding field trip held by an Audubon group or other club is a sure way to quickly develop your identification skills, with knowledgeable trip leaders able to identify bird songs and calls. Leaders also can provide a wealth of tips for identifying various species by field marks, behavioral traits and habitat types. is a great place to view spring hawk migration. 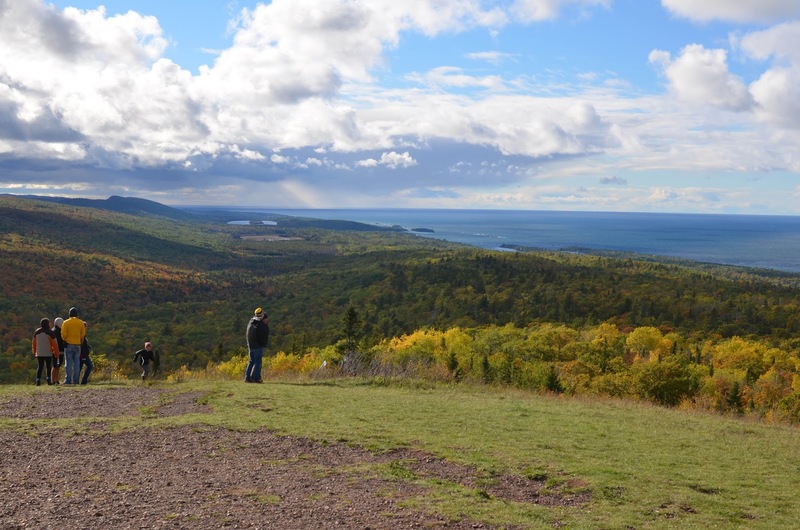 Beyond state public land sites for locating migrating spring birds, there are funnel points where birds congregate in migration, like Whitefish Point in Chippewa County, Peninsula Point in Delta County or Brockway Mountain in Keweenaw County. 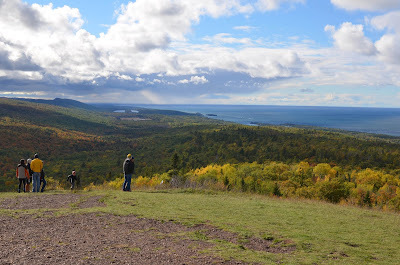 Brockway Mountain, near Copper Harbor, is a fantastic place to see hawk migration. provided a meal worm breakfast. Another great location to find migrating birds is in your own backyard. Some of the colorful favorites, like indigo buntings and rose-breasted grosbeaks, are attracted to sunflower-seed feeders. 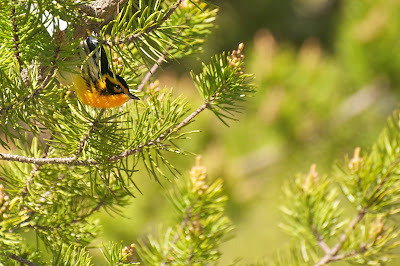 Baltimore orioles, and some other species, are attracted to oranges. Cut an orange in half and secure it to a tree or post, with a perch nearby. Keep an eye or an ear to the backyard. Migrating birds are also attracted to bird baths. Sharply marked beautiful spring warblers can pass through an area in flocks containing several species. A good tip for trying to get a good look at warblers is to locate movement in the tree branches and look there with your binoculars. Often, the bird will pop into view from behind leaves or branches. 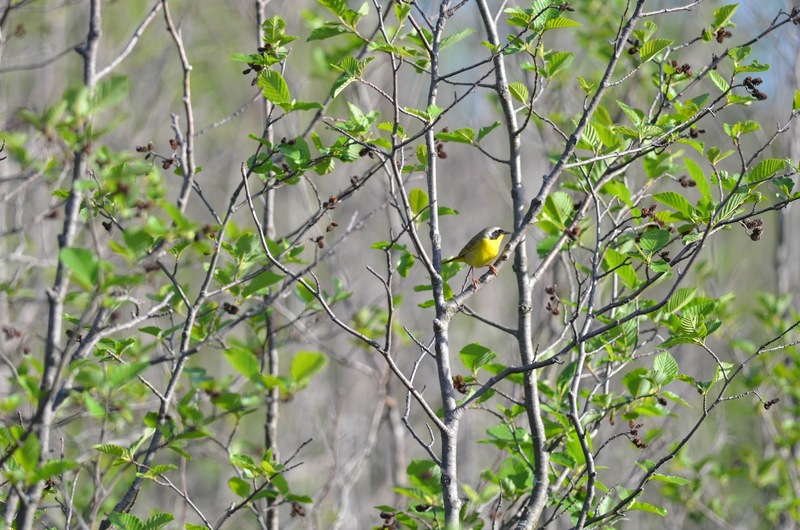 Common yellowthroats are warblers found in wetland areas. He said another good tip is to use range maps in a bird field guide to study which warblers are likely to be found in your area before you go out to look for them. The Cornell Laboratory of Birds “All About Birds” website is a great source for bird identification tips and song samples. Whether you’re watching out the window in your own backyard, visiting a Wetland Wonder or a state park, or taking a birding hike, you never know what beautiful, dazzling “presents” you may find under and in the trees.